My Uncle Peter was born in 1954, a challenging time for a child born with special needs. It was a time of ignorance and judgement, with baby Peter’s life on the line. 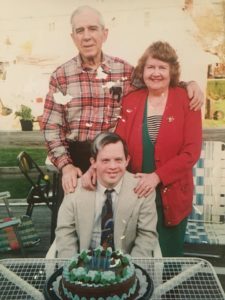 The doctors took my grandparents, Pete and Eileen Panos, aside and said that someone in Peter’s condition with Down Syndrome wasn’t supposed to live past the age of five. My grandparents couldn’t believe it when the doctors advised them to put Peter into an institution where he could live out his few years. You already have 3 healthy children. You don’t need this burden, they had said. My grandparents thought it over and decided that they would raise Peter with love for the years they had with him, and took him home. They tried to give him the life he deserved, filled with care and love. It wasn’t easy, as the doctors had forewarned. Peter would run out of the house and get lost on his way home from school, terrifying my grandma. My grandparents, along with my mom, aunts and uncles, all helped with raising Peter. Though challenging, it helped them become a strong family unit. Routine became Peter’s success, music his sanctuary. 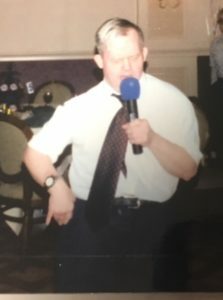 He loved to sing and dance to the Englebert Humperdinck record, playing over and over again his favorite song “Please Release Me” that he sang at every family function with pride. He would sing the lyrics and smile his big smile, stomping back and forth and clapping his hands to the beat. Peter became not only a part of the family but the heart of this family. Despite the troubles in the world, Peter’s innocence always focused on the good things. He always said grace before eating, raising his glass and toasting “To all the family. Peace to the world, we do need it.” He loved flipping through the tabloid magazines, not because of scandal or obscenities, but because there were pictures of pretty women, pointing out a pretty face amidst a magazine that focused primarily on trash. And yet he was the one who wasn’t considered normal in our society, considered special and different. As a child, I knew Uncle Peter was different but I loved him more because he would laugh and play games with me. He was an adult with a child?s sense of humor and a heart of gold. When I did understand, I held his hand as we crossed the street. 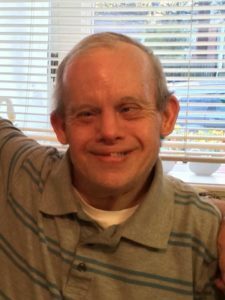 I explained to my friends, who would look uneasy in his presence, that he was my uncle and educate them about Down Syndrome. I was never embarrassed and never even noticed that my family was different than others because we accepted and loved despite differences in appearance and those physically and mentally challenged. I was enlightened at an early age, whereas for others it may take them a lifetime to realize what I have always known. My grandparents, inseparable and so in love for 58 years, faced the autumn season of 2001. My grandmother took ill and passed away right before Thanksgiving of that year. Though we all were at the wake with tears in our eyes, Uncle Peter stood tall beside my grandpa. “Mom is in Heaven” he would say so sure, giving us faith and hope believing that she truly was. It was like though he never was fully a part of this world, he could see and believe further than all of us. My grandpa would say Peter was an angel, for during these past 17 years Peter was there for him, a companion, a son, a friend. Someone my grandpa could take care of and find a purpose to live, finding hope despite the terrible emptiness and helplessness he experienced after losing his wife. There is that saying, “God works in mysterious ways”. I now understand what that means. What was supposedly a burden at birth, became and was a blessing to not only my grandpa, but to all those who were fortunate enough to know Uncle Peter. If you talked to him, you’d end up singing Beatles tunes like “Love me Do” or “I Want to Hold Your Hand”, or quote the TV show “The Honeymooners” (To the Moon Alice). You would find out how much he loves Coke with no ice, and McDonalds hamburgers. And you would become part of his family.? Uncle Peter, after suffering from dementia this past year, was hospitalized in January. I was afraid to go see him, afraid he wouldn’t remember me. My mom told me that he was not doing too well and that they were preparing to place him in Hospice Care. I was going through a difficult time in my life, but something told me to go to see him. It was the night before my 35th birthday, and ironically he was in the same hospital that I had been born. It felt strange going to the place where life begins and ends; the start of my life and now the place where Uncle Peter was living out his final days. I walked in, nervous but following my heart, knowing that I needed to see him, to be there for him. Even if he didn?t remember me, I wanted him to know I was there and that I loved him. I walked into the room, and Uncle Peter was in pain, unable to speak, just grunting. He looked so thin and frail with tubes stuck in his hands, the life and vigor drained from him. A young girl stood next to him, a hospital volunteer, since someone needed to be with him all the time. I slowly took Uncle Peter’s hand, which was shaking. I spoke to him, telling him I was there beside him. He grasped my hand for comfort, similar to how my child grasped my hand in love and comfort. I told the girl stories about him, how I would take him to the dances and he would dance with this girl Annie, and the beautiful moment when he sang “Please Release Me” at my wedding. As I was telling the stories, Uncle Peter woke up and his bright blue eyes lit up when they saw me, like they recognized me. I played music on my phone, the Pandora station for Englebert Humperdinck and songs that we sang together came on, like “Hey Jude” and the Elvis song “The Wonder of You”. I sang the words and though he couldn’t sing, he moved his lips to the music, the songs and love still vivid in his memory. Family and Music the things he held onto the things he treasured more than anything. Two days later I returned with my sister Cassandra. It was my grandpa’s 98th birthday, February 2nd, and he was recovering from pneumonia at an extended care facility miles from where my Uncle Peter lay dying. He felt terrible he couldn’t be with Peter, but through the wonders of technology, Uncle Peter’s eyes flickered open at that same moment we were facetiming with my Aunt Jeannie, who was with my grandpa. Uncle Peter was awake and able to see his father on his birthday, like they were side by side, as they had been through life. Uncle Peter passed away two weeks after I saw him in the hospital. I was praying that my grandma would take him, so that he wouldn’t suffer any longer. He passed away minutes before Valentine’s Day. It was like the song lyrics from his favorite song “Please Release Me, Let Me Go”. He was ready to go to Heaven to be with his mother. He passed away at 64 years old outliving the doctors who had told my grandparents that he wouldn’t live past the age of 5. Proving them all wrong, with that twinkle in his eye, and a song in his heart. I try to see the world through Uncle Peter’s eyes, all of us united in love and understanding. Toasting to a world, praying that there will be peace in the world. We do need it. When you are searching for God’s blessings in life, look around you…you may discover that it was right beside you all this time.